Property 7: Fashination, privacy and refined atmosphere, in romantic apartment of medioeval village. Property 20: Beautiful stone house with garden and private pool. We had an amazing 2 weeks at Casabella. The farmhouse is beautiful, full of original features, well equipped and very comfortable. The views from the terrace, over the vines to the mountains are gorgeous and very relaxing and calming. 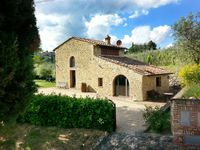 The location is perfect, tucked away in a small hamlet, but only 15 minutes to Sienna and about 5 minutes to the nearest village, shops and restaurants. We visited Siena, Montalcino, Montepulciano, San Gimingano and Masa Maritima, all within about an hours drive, and there are lovely quiet woodland walks which can be accessed directly from the farmhouse. Prior to our arrival Marzia was quick to respond to any questions regarding directions, shopping etc. Marzia and Renzo met us at the farmhouse on our arrival and showed us round, and throughout our stay was very kind,friendly, helpful and always available for if we needed to ask her anything. We stayed in April, so the pool wasn't open, but you could still sit on the deck and enjoy the sun and the views, the time of year meant that everything was very fresh and green and warm but not too hot. I would thoroughly recommend Casabella to families and groups who want a peaceful relaxing break but also to explore the delights of Tuscany. Clean. Had everything one needed.